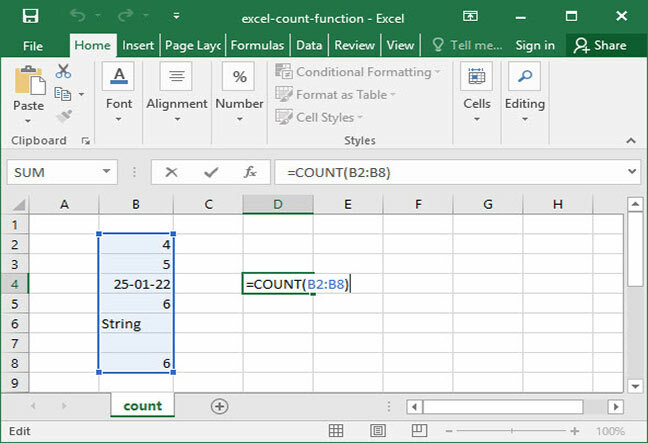 Excel's COUNT function is one of the most powerful tools to help speed up your work and create flexible, dynamic worksheets. Simply put, the COUNT function allows you to count the number of occurences of a numerical value in a range. Let's take a look at how it works. Simply put, COUNT will take all its inputs and spit out the number of inputs that are numerical values (rather than strings of text, blank cells, or errors). The above formula outputs the number 3, because there are 3 numerical arguments contained within the COUNT function. This formula also outputs 3, because only 3 of the arguments provided are numerical. The above formula outputs 5, because five of the cells included in the input range contain numerical values. Note that Excel treats the date, 1/25/2022, as a number. The cell that contains the string, "String", as well as the blank cell, are excluded from the count. COUNT treats dates as numerical values, because its number formatting stores dates as integers. Try changing the number format on your date cell to "Number" to see what we mean! Count up numerical survey results and control for non-responses. Once you've mastered COUNT, try moving on to our tutorial on the COUNTA function, which will allow you to count cells that contain any value, including text. Questions or comments on the above? Let us know in the Comments section below!